Journalists raced their editor to the office in a Top Gear-style challenge as part of a week-long campaign looking at transport issues on their patch. County-wide news website Devon Live is running series of features under the name ‘Gridlocked Devon’, focusing on sustainable travel and pollution. 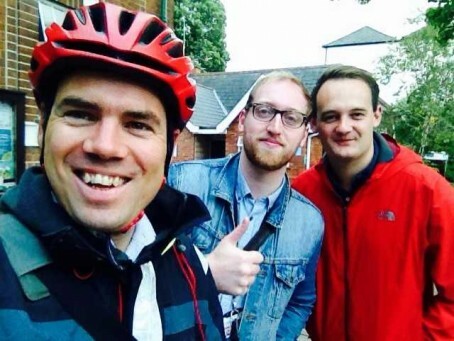 The campaign began with live Facebook coverage of a travel challenge in which reporter Alex Richards took the train and Rom Preston-Ellis drove into Exeter from a nearby town, while website editor Patrick Phelvin cycled. The challenge highlighted the problems faced by motorists in Exeter and the advances made in the city in providing dedicated cycle routes. The following day Devon Live unveiled the results of an investigation into council parking which showed that councils, while encouraging cycling and the use of public transport, have also provided free or subsidised parking to hundreds of employees. The series also included a round-table discussion, again broadcast live on Facebook, where members of the public will have the chance to pose questions about transport issues to experts. Patrick said: “I have been impressed at just how much had been done to improve cycling in Devon, and there are plenty more improvements in the pipeline, and driving is becoming increasingly expensive and difficult. “There is an increasing understanding of the dangers posed by air pollution, and it was alarming to find out that parts of our rather wonderful county are as polluted at areas in large cities.